02.20.2004 - "Can't you just put out some sort of a powder or spray to keep away snakes?" I hear this question on a fairly regular basis. I know that there's a market for such products. Many people simply can't stand snakes, and harbor a real phobia regarding them. And where there's demand, there's products sold to meet that demand. Alas, so far I have tried every one that I can find, in multiple scenarios, and I am absolutely convinced that none of them work. 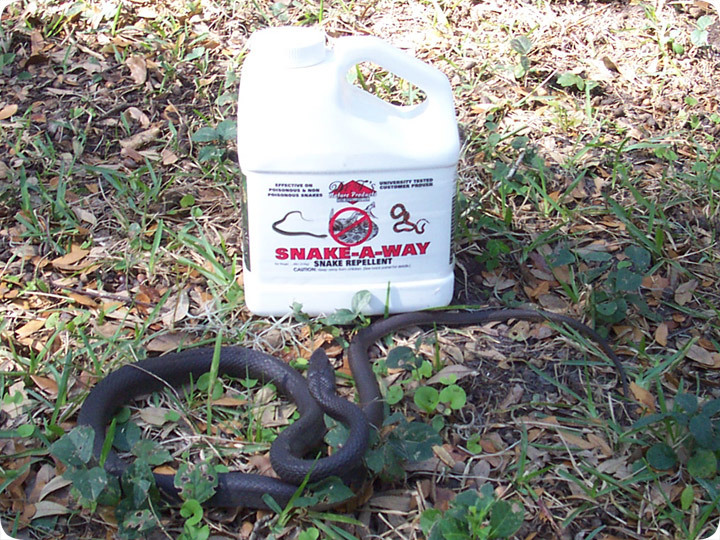 As a wildlife removal specialist working in central Florida, I have the opportunity to work with unwanted snakes on a nearly daily basis. I also have the great privilege of working with uniformed people who don't have much common sense when it comes to wild critters. I've had people ask me if squirrels lay eggs, if raccoons can survive by eating insulation in an attic, and just as silly, if there's some powder that can keep snakes away. Here's the deal, people. Is there some powder that I could sprinkle around your house to keep you from ever going inside again? Well, maybe Anthrax, but other than that, no. It's the same with snakes. They're not going to pack up and move to a whole new habitat because of any scent that's spread around, at least any of the ones that I've tried or can think of. I've dealt with several snake denning areas, and have poured large quantities of various snake repellent powders down these burrow holes, and the snakes don't care, they slither back and forth right over the powder, flicking their tongues all the way. Most snake powders that I've seen are composed of cheap, common ingredients. Otherwise, manufacturers don't make any money. The most common of these, of course, is the end-all-be-all-cure-all of wildlife repellent, the good old fashioned mothball, or naphthalene. Crumble it into a powder, slap a fancy label and directions on the package, and it's got to work, right? Well, you can go ahead and try (and poison the environment while you're at it), but it's just not going to work well. If you want an effective snake powder, sprinkle the magic powder of knowledge into your head, and learn which snakes are harmless (about 99% of them) and which are harmful (0% of them if you don't go grabbing them) and voila, all your snake problems will go away. If that doesn't work, and you do want snakes removed, then your best real bet is to hire a local pro who can come and remove the snake, which is what I do, or you can use a trap that will actually catch the snake and allow you to relocate it. If you do have good luck with a snake powder, well then fine for you, it was probably a placebo. And if you do find a good one that works with real evidence, let me know, so that I can sell it on my snake calls!